I have a slight obsession with clothes that feature some sort of animal. I have an small collection of animal printed sweaters and now a collection of bird dresses seems to be happening in my closet. 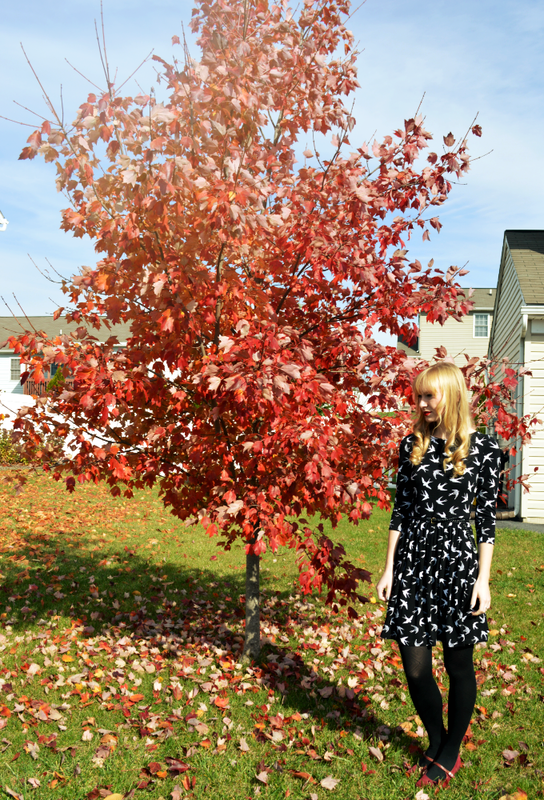 This swallow print dress from Asos is so soft and comfortable, I'm excited to style it a few different ways over the winter season. This time I styled it with a pair of vintage heels, a braided belt, red lips and cat-eye sunnies for a family get together. I love that dress, it's so so so cute! Oooh that dress is adorable. I love your sense of style. The red shoes are adorable, too! I wish they weren't thrifted so I would know where to get a pair of my own! This dress is adorable! I've only recently got into the animal print thing! I bought an owl print skirt and I'm excited to wear it! Love animal prints -- like, prints of animals. You always have the best shoes. Also, is that a large, scary orange behind you? ?